The Dell T440 server can be used as a tower or 5U rack server with an optional rail-mount kit. It's designed for use in remote or branch offices but can also be used in datacenter environments. This is an excellent platform that can grow with your business. Intel's new Xeon Scalable processors are supported on this system. Administrators can choose from Bronze, Silver, two flavors of Gold, or a Platinum processor supporting up to 14 cores. Start with just a single processor or purchase with dual processors. There are 16 DDR4 DIMM slots supporting registered (RDIMM) or load reduced (LRDIMM) memory modules. With a single processor ten of the 16 memory modules are active. In a two processor configuration six more memory slots are active for a total capacity of up to 512GB. Depending on memory module speed, memory configuration, and supported processor speeds the system is capable of 2666MT/s. Administrators have storage options with the Dell EMC T440 tower server. It will support either hot-swap or cabled drives but with a cabled drive setup the drives are installed in an internal drive carrier. There are two chassis that support either four or eight 3.5-inch SAS or SATA HDDs or SSDs for up to 80TB of storage. Of course, you can also install 2.5-inch drives in the 3.5-inch drive slots using an options 2.5-inch drive adapter. Another option features up to 16x 2.5-inch drive bays and a maximum storage capacity of 61TB. Optionally, Administrators can also install a PCIe M.2 storage device. Boot Optimized Storage Subsystems or BOSS offers super-fast boot up and HWRAID for two M.2 storage devices of either 120GB or 240GB. For hypervisor support, you can choose an internal Dual SD Card Module with vFlash that can also provide failsafe redundancy when used in mirror mode. The vFlash module on the iDSDCM offers 16GB of storage. Several legacy storage HD/RAID controllers are supported along with three update versions, the S140, H740P, and for external storage the H840 which can support up to 255 storage devices and can be paired with the Dell PowerVault MD14XX storage enclosure for direct attached storage (DAS). A 12Gb/s SAS HBA offers network attached storage (NAS) options. Non-Uniform Memory Architecture (NUMA) is supported. Five PCIe 3.0 slots give you options to scale by adding additional NICs, HBAs, Fibre Channel, GPUs, and internal and external PERC 9.0 or PERC 10.0 RAID controllers as described above. 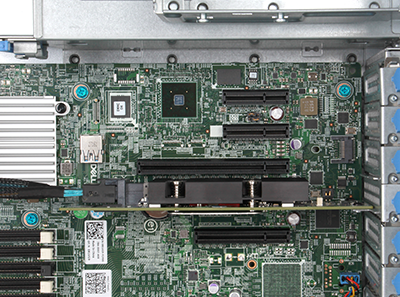 The system features an integrated dual port 1GbE network interface but you can install up to five PCIe add-on cards. Five USB 2.0 and three USB 3.0 ports are split between the front and back of the system for connecting various external devices. The system can accommodate a maximum of two GPUs but requires an 1100W power supply. The dedicated iDRAC port on the back of the system enables remote access with an enterprise license. The new 14th generation of servers, including the Dell EMC PowerEdge T440 Tower Workstation, offer high adaptability along with future-proof performance, high capacity, and a range of I/O options to suit your workflow. This may be an entry–level system for SMBs but it would also be right at home in a datacenter environment with a rail mount kit and 5U of available space in your enclosure.